I’m sure that many of you a few years ago had a chance to see the hit musical, Zorba. There was a marvelous scene in that very interesting musical in which to the music of Greek instruments and with dancing and rhythmic clapping, the question is being asked, what is life? What is life? Many interesting answers are given during this sequence. I’m sure that many of us, though maybe not in quite as dramatic a style have asked, what is life all about anyway? The interesting thing is usually we ask that question when we’re discouraged or when we’ve had some terrible thing happen to us. We accept life when things are going well, but when we have problems, what’s it all about anyway? Well, actually life cannot be defined. Life can only be lived and from within out. By the degree that we give expression to the within in the outwardness of our life, to that degree the life we live defines itself. There’s really no way to understand life by what comes to you or by what happens around you. You’ll be asking the question, what is life, over and over and over again and you’ll find no satisfying answers as long as you’re thinking in terms of why he does that and why the world is like that and why they treat me in this way on my job. You can only know life by how you deal with these things out there which tells a great deal about what is happening in you. Life for you can only be defined by how you see yourself thinking and feeling and acting. Someone once said, “If only we knew a little less and understood a little more.” Maybe that’s what our study of truth is all about, not just getting more information about life. I suspect we have more information about life than we know what to do about now. The thing is not getting more information about life but unlearning some of the things we know and seeking for a deeper understanding. In our entire Western culture, there has been a tragic neglect of teaching the law of giving. I think that religious institutions have failed people miserably in this respect, undoubtedly because most institutions are quite preoccupied with their own need to receive support and constantly exhorting and pleading and demanding that religious followers give in order to keep on the right side of God. Preachers have talked of giving as a returning of a portion of our income back to God. And if I can say so, this is absolutely ridiculous because this skirts the issue by dealing an anemic God of the skies who sits up there and says, “I’ve given to you all these years, now you please must give back to me.” Like a parent who’s involved in smother love, “After all I’ve done to you, look at the way you’ve treated me.” I mean it downgrades and denigrates the whole process of a fundamental divine law of the universe. Jesus says, “Consider the lilies of the field, how they grow.” By nature’s law, they grow and unfold from bulbs to flowers. In this do it yourself age, there’s a great deal of interest in growth and development and courses and techniques and lectures abound in helping you to get more out of life, to find satisfaction in life, to earn more money from your life or from the world or from the stock market or whatever, how to influence people, how to achieve recognition, how to get this and how to get that. The thing that we need to understand as students of this insight of truth is that development is very important. But develop does mean getting something. It does not mean putting on something. It does not mean adding something to your life. The word, develop. is an interesting word. It’s related, as I’m sure you know, to the word, envelop. And the word envelop means to enclose. So the word develop means to unfold. We all know that of course but we forget that because when we take a course of self-development, usually we’re thinking in terms of he’s going to give me a technique that will help me to put on and be a more radiant person and achieve a new self-image and all of these things which are vital and important, but we lose the thread of the continuity of the divine process that life is lived from within out. The bulb develops as it unfolds into the flowering lily. How beautiful are the bulbs, the tulips and all the various bulbs today in the garden. As Browning might say, “To develop is to open out a way whence the imprisoned splendor may escape.” All spiritual development, human development, psychological development, I don’t care what it is, is releasing imprisoned splendor. If you don’t have it within you when you go into this psychological or spiritual or metaphysical course that promises that you can do all these things, if it’s not already within you as a potential, there’s no way that any technique or any treatment or any affirmation or any prayer can bring it out of you. Develop is what it’s all about. There is no way that a course or technique can make a difference in your life until you learn to give. That’s what development is. It’s giving. Let your light shine. This is why I believe failure to teach the law of giving is a tragic neglect because there’s no way that we can understand what life is about until we understand that life is a giving, unfolding process. Unfortunately, we have been conditioned in our Western, materialistic culture to believe that life is to be found and experienced and acquired and amassed from out there somewhere and the whole focus has been on getting, getting, getting, getting rather than on giving and that’s unfortunate. I was walking down the street one time. A couple of men were up ahead of me and they were engaged in conversation, very spirited. The men were waving their arms and so forth. I only heard one phrase that was discernible, but it was enough. One of the men said, “Just tell me one thing, what’s in it for me?” He could have been talking about anything, but his attitude was clear. Sadly, I think we’d have to admit that that attitude is also quite common, what’s in it for me? But in our new insight in truth, we make a great discovery, a shocking one at first, that this John 3:16 refers to you and to me. You are that son. There is that of you, the whole person of you or the Christ of you as Paul would call it, that is begotten only of God. And if you believe in this God-self or Christ of you, then you begin to live on an eternal vibration. This is what everlasting life refers to. It’s not life in terms of continuity of years, it’s life in terms of depth. Eternal life is abundant life, full and complete and prosperous life. But you see, the important key to this foundation statement of the whole Christian teaching, God so loved the world that He gave. And you’re created in the image likeness of that divine givingness. And if you’re going to make any sense out of life, if life is going to have any rhyme or reason, if you’re going to realize in any way the free flow of life, you must stop thinking about get, get, get, get, get and start thinking about giving, unfolding, radiating, expressing. Giving must become the main thrust of your whole life experience. And when it does, when you discover the wonder of giving, then truly you come for the first time to know what life is all about and your life experience becomes joy, joyful, and full and affluent because there’s a fundamental cosmic glow involved. Life to the person who begins to experience wholeness becomes a giving process. Now, I’m not just talking about monetary giving. It’s an interesting thing, any time a minister or a teacher or a preacher mentions the word giving, everybody takes a clamp on their wallet or their purse. “Here comes the commercial. He’s after my money again.” I’m not just talking about monetary giving or church giving or tithing. Certainly that’s one part of it, like the many rays of the sun. But I’m talking about a basic attitude or approach to life that may be out formed in many different ways. It is the basic awareness that life is a matter of developing or unfolding from within and there is no way that it can be reversed on itself. We can frustrate it. You can desecrate it. But you can never lose it. It is always the radiant unfolding process from within, the realization that life is not something to get, but something to unfold. But the important thing is while he works intently down on the feet, this figure towers over him with arms outstretched in great compassion, looking down upon him lovingly, blessing him while he works. What’s in it for the boy, someone might say. That figure that he’s carving may ultimately win fame or fortune for him someday or it could conceivably wind up in an old warehouse somewhere totally discarded. But there’s one thing that we must understand and unless we understand this, we miss one of the great principles of life, one of the great insights that helps us to understand what life is all about. And that is that nothing can ever exceed or detract from the compensation that that young lad is receiving in that instant while he’s working. 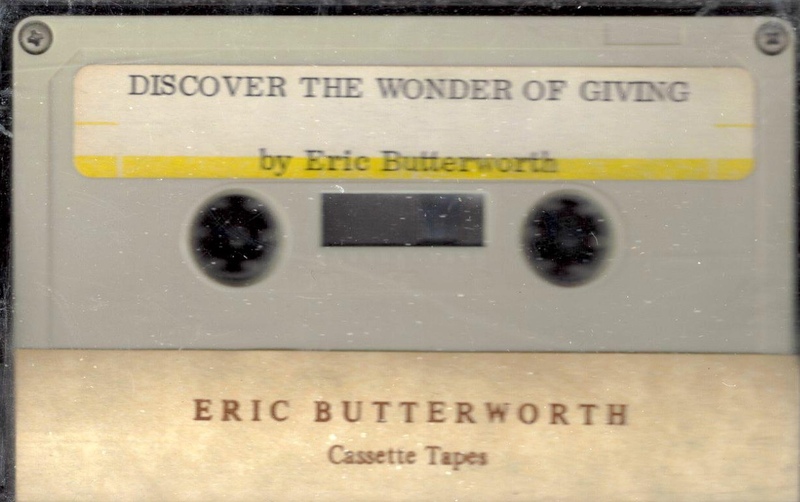 That’s the wonder of giving. But also we must remember, and I believe this is so very important, that sculptured piece could never be duplicated by a person who lacked the giving attitude of that youngster. Right here, I believe very strongly we have one of the factors of the whole economic evolution or devolution, if you will, of the Western world, the basic cause of inflation and a lot of other economic problems, which is what I call the great depression of worker attitudes. We don’t hear very much about this. We hear about all the many ways in which we can try to prime the pump and get the economic conditions to stabilize, but unless we can bring about a renaissance of commitment on the part of workers, there will be no real economic stability anywhere in the world. What is it for me, you may say, talking about your work and you may have a feeling, perhaps a sincere feeling and maybe a right feeling, that you’re not properly compensated in your job. If you discover the wonder of giving, you will find a great blessing of inner fulfillment in your work which will lead to better work obviously and by the law of causation, which is always working, it will lead to greater affluence. And if one doesn’t believe that, then he might just as well abdicate from the universe of law and order. And if you still ask the question at that point, but what’s in it for me? Then I might as well tell you right off, I believe that you’re grossly underpaid even if your income is in six figures. If all you get out of your work is a paycheck, then my friend, you’re shortchanging yourself. I hear it said often, and I’m sure you do too, “Oh, I don’t know. My life has no meaning whatever.” This sense of meaninglessness which is pretty broad and rampant, leads to boredom, leads to depression, leads to loneliness, leads to addictions of alcohol and drugs and overeating and all sorts of complicated problems. Actually it makes about as much sense for a person to say, “My life has no meaning”, as it does to stand in a dark cave with an unlit flashlight in your hand and say, “This place has no light.” For Jesus would say, “Let your light shine.” And there is no other way to find meaning in life. In other words, the meaning in life is not to be found out there. It is something always that you release from within. You put meaning into your work. You put meaning into your experiences, into your relationships, by the giving attitude in which you deal with them, in which you perform the tasks, in which you express your love in your relationships. There are many persons who find tremendous meaning in their life through a kind of work that may be a total drag to somebody else that’s sitting at the same bench doing the same job. It is not the work, it is the sense of giving in which it is done. We forget this sometimes, but it’s something that maybe we need someone like a teacher to remind us. One depressed woman came to me one time and she said, “My life is so empty. But I’m sure that I could be happy if I had an exciting and meaningful job like a nurse.” I said, “All right. Why don’t you follow a nurse around for a while as she does her routine tasks. Perhaps handling syringes, changing bedding, maybe occasionally taking care of a bedpan, coping with neurotic patients, all important duties, very important, but scarcely exciting enough to satisfy the human spirit.” But when that nurse does something beyond her regimented duties, when she’s kind to a patient, when she comforts someone who is critically, perhaps terminally ill, she gives meaning to her life through her work. But you see, any job allows for this. I don’t care what the job is. Any job allows for this if you make the effort to see it in the right light. If you think, give instead of get. Meaningfulness in life has nothing to do with what the world demands of you, but everything to do by the way in which you deal with it. Remember? How long ago was it people used to say, “Another day, another dollar”? They don’t say that much any more, maybe another minute, another dollar. I don’t know, depending on where you are, but not a day. Ask the average worker what he’s getting out of his work and what do you suppose he will tell you? “Dollars and cents and fringe benefits, that’s what I’m getting out of my work.” What are you getting? What do you expect? Now certainly, one should be prosperous and I believe in prosperity. I think that it is certainly good for a person to envision and to demonstrate an increasing salary position. But under cosmic law, let’s don’t delude ourselves, the key to that kind of demonstration, either the acquiring of it or the sustaining of it is the consciousness of giving. Emphasis upon getting, getting, getting, simply frustrates the flow. When we understand the law of causation, we know that work is important in our lives, not primarily as a means of getting a paycheck. Many people live all of their lives or most of their lives until they retire before they understand this, that the most important part of your work is not simply a place to get a paycheck, but it is a place by which you as a creative being may have the opportunity to plug in or to synchronize with the creative processes and give expression to your creative flow. This is why retirement is such a traumatic and even debilitating experience. Many persons in retirement despite the fact that they have retirement benefits that are adequate, are totally, totally emasculated in their experience because they’ve been cut off from any challenge or opportunity to give expression to the creative flow. Suddenly they realize in retrospect, “I’ve been deluded all my life. All my life, I thought I was working just to make money. But now I realize that I should have been working to make a life.” It’s so important that we learn that along the way. Again, of course one should receive a salary. But it is the consciousness of giving that determines the amount on the paycheck. I’ve always believed this very strongly that one sets his own salary. You may say, “Not me. If I set my salary, I’d get an awful lot more than I do.” But in consciousness, in the way in which we relate or synchronize ourself with the divine forces, we set our own salary. We determine the supply. If you don’t believe that, that’s so fundamental in metaphysics. You better go back to point one on the game and start over again because that is absolutely fundamental. If you can’t believe it, then they said many with Jesus, many turned away and followed him no more because they couldn’t accept fundamental cosmic laws. I say, if you can’t accept this fundamental cosmic law, then you’re wasting your time in the study of metaphysics, a total waste of time. Jesus said, “Give and it shall be given unto you.” The divine flow requires but one thing of you, your consent to be a receiving channel. It’s like the water faucet that has to be opened to the flow in order that the water may flow forth freely. Jesus is stressing the need to get into a giving consciousness in order to sustain the flow of good in your life. Now, again, we don’t want to let ourselves jump into all sorts of reaction to clichés and the reaction itself so often is a cliché or a prejudice. Jesus here is not telling people, “You’ve got to give money gifts.” This isn’t it. He’s talking about fundamental law, the money gifts and the gift in your work and the givingness of love and sharingness in your life and so forth, this all is a part of the outpouringness of this consciousness. But Jesus is talking about fundamental law. What he’s saying in terms of a state of mind is think give and you will get. Such thinking will lead to a giving vibration which is incidentally the key to demonstrating prosperity. Now Jesus says, “To him that hath, it shall be given and from him that hath not, shall be taken away even that which he has.” To him that has the giving consciousness, the person who has a giving consciousness is going to receive. The person who does not have that giving consciousness is a person from whom all the things that he worked so hard to get will just erode and fade away in many, many ways and in our day and age there are lots of ways by which it can dissipate itself. John Bunyan once expressed the little thought, possibly tongue in cheek but undoubtedly touching on a fundamental law, “A man there was and they called him mad. The more he gave, the more he had.” You see, the committed giver is always the happy person, the person who realized spontaneously that life is lived from within out. He’s a happy person because without knowing it, he is tuned on and synchronized himself with the givingness of the creative process within. The committed giver is a secure person. It is doubtful if one can ever find real security unless he becomes a committed giver. The committed giver is a satisfied person and he’s a person who experiences the free flow of affluence in his life. The word affluence, from its etymological background, actually means free flow. Invariably, the person who always seems to make a better life for himself from the same identical income as other people on the same job is a person who has learned to give. As the ad says, he’s found the better way. Not the better way just in the fact that he’s learned how to save, that’s all very well and good and important. But because somehow he has discovered that life is a giving process and he thinks give. His whole consciousness is giving in his work, in his relationships, in everything that he does. There is a wellspring of infinite life substance and intelligence within you and yours is the privilege at any time of giving way to its flow. If there’s lack of any kind in your life, something is blocking the flow. The most effective remedy, not reach for the aspirin or reach for the Alka-Seltzer, these are secondary things that may or may not be of any great benefit to you. But the most effective remedy is start the giving process. There may be times where you say, “But my pocketbook is empty. I have nothing to give.” And again, you’re thinking in terms of money. Start the giving process. There’s never a time when you cannot turn on your light, when you cannot release more of your imprisoned splendor and let that imprisoned splendor motivate you in ways of givingness, even if it means to get out of your flat, out of your apartment, out of your house, and get out and do something for somebody. Get the process started by a giving relationship rather than “why does the world let me sit here without helping me?” Get out and do something. Commit yourself in some way, become a giver. The time to do this is when you’re in the most desperate straits. There’s an old axiom, when things get tight, something’s got to give. We always thought that meant that the chain’s got to break. That’s not the fundamental meaning of it. When you have problems in your life, the need is to give, to give way, because you can frustrate this divine flow just so long. The more you frustrate it like the prodigal son out on the far country, the more you come to know want. But the answer is, as the prodigal realized it, he came to himself and then he said, “I will arise and go onto the father.” In other words, I will get back to the relationship of my inwardness and know that life is an inward out experience. No matter what the problem, giving is the key to the solution. At times you may be puzzled about what you can do in the face of some particular problem, which way to turn. But a safe place to start is to open the flow by some kind of giving. I don’t care what it is. Begin to think in terms of giving. If you need employment, if you have a physical problem, whatever it is, just stop and think, “Now how can I reverse the flow of my life by giving something?” Go to your closet. Look at some of the clothes you have. Think of perhaps the maintenance man downstairs or perhaps his wife, possibly here’s something that I have sitting here that I haven’t worn in over a year. Why don’t I pass it along? Get your whole consciousness thinking in terms of giving instead of receiving. Why oh why doesn’t the world do something for me? What’s life all about anyway? Life is a giving experience and if it seems that the world is not giving you your just deserts, the question is, are you giving of yourself? That’s a good starting point. If you need healing, if you need harmony in a relationship, if you need right relations, right adjustment in a business deal, don’t delude yourself that the problem is just out there. The problem when we understand consciousness is in us and the solution begins in us always. It begins in your consciousness and my consciousness, in our willingness to give way, our will to stretch forth our hand. Now I’m going to lay something right on the line this morning. In the study of this new insight in truth, it is important to know that the whole ball of wax, if you will permit my saying it, is rooted in the cosmic law of causation and the realization as you give, so do you receive. Again, this is not a pitch for money. It is a heart to heart talk with you about how to make the most of your experience in your study here, in your study at the center, or wherever you study the truth. A true student who wants to find the better way, if you will, should become a good giver. That’s fundamental. There’s no point in deluding ourselves because we’re dealing with law. We need to keep our channels open through a commitment to some kind of systematic giving, a new attitude about your work, a new relationship, a new way in which you let yourself give way and step back in situations in life. But become a giver and don’t let yourself get turned off as I know many have by the seeming commercialism of religious groups. If a church becomes materialistic, that’s their problem. But don’t let it become your problem because your giving is absolutely imperative. If you get turned off to giving because churches are materialistic, then it’s like pounding yourself on the head because somebody else is doing something bad to you. Your giving can be diverted wherever you want it to and however you want, but regardless of where the giving goes, keep it going because you need it in terms of the lifeline to health and abundance. When you discover the wonder of giving, you will wonder how you could have lived so long in any other way because it’s the key that makes truth work, that opens the door to the good that you’ve always been seeking. It’s that which gives life the added glow. It can be one of the great discoveries of your life. And when you become a committed giver, when you think give, your consciousness is always moving in the direction of how can I give more of myself, you could no more go back to the old way of living than you could return to life in prehistoric times. But remember, the attitude with which you work is a very important kind of giving, either on the job or in the menial tasks of your everyday life. Giving also means the willingness to yield, to step back, to give way, such as giving way to another motorist at an intersection or occasionally stepping back when someone is fighting you for the seat in the subway. It’s a kind of love and nonresistance that will make all of your relationships harmonious, that will prevent problems even before they occur because of your giving consciousness. But it also means another thing. It’s like two sides of a coin. Giving also means being a good receiver. Did you ever realize that a person who has never learned to give is also a person who is very, very difficult to give anything to? Test your give yourself. If someone presents you with a gift or someone does something for you or even sends you a Christmas card or a Thanksgiving card or a Mother’s Day card, do you protest immediately? Say, “I can’t let you do that for me”? Or do you hurry out to reciprocate and buy a card to send it back to them? Or hurry to invite them back to your place after they’ve had you over for dinner in their place? Did you know that it could be that you are subtly rejecting the gift of the other person when you do this out of a fear of obligation or even more, out of a sense of unworthiness, out of a feeling that you are totally blocked in the flow of good from within yourself? The interesting thing is you may be praying for help and someone offers you that help and you say, “But I just can’t let you do that.” Why not? How do you suppose that answer to prayer is going to come, through some letting down of baskets from the heavens? It’s so important to understand this. If we’re going to receive that which we are seeking constantly in our work in truth, not only must we become givers, but we must become receivers and work out the blocks in our consciousness that keep us from receiving. Many, many persons more than are really aware of it receive the kind of compensation they do at their work even though they resent it, they talk about it, they even protest against it because deep within themselves they feel unworthy of anything more. That is the self image process, you see. One needs to become a good receiver and to become a good giver and we’re working on the same fundamental principle. But again, there’s a whole new world awaiting for you. A new level of life that can open to you, a new experience of the dynamism of this thing called truth, discover the wonder of giving. Truly, it is the better way. And the day will come when you’ll insist that it is the only way. I’d like you to join with me for just a moment in quiet. I want you to be very still for a moment. I would like you to envision for yourself, if you will, something that we’ve tried to suggest symbolically through the logo that the Unity Center uses. You remember it. It shows a kind of a stick figure in the center with arrows from all sides pointing into him. Suggested by the realization of Plotinus who says, “There comes a time when we realize that the whole universe is rushing, streaming, pouring into us from all sides while we just stand quiet. This is the realization of the givingness of the universe. God so loved the world, God so loved you that He gave, and that givingness is ceaseless and eternal, world without end. So therefore, we accept. We become gracious receivers and grateful receivers and then we realize that life has meaning when we understand that each of us is created in the image likeness of that divine givingness. We seek constantly to become givers, to flow with this creative stream. Someone wrote a book sometime ago called, Try Giving Yourself Away. It’s a vital realization. Get in the thought that life is a giving process. As you give, you receive. As you give, even while you’re giving, there’s a receiving. There’s an awaking, there’s an unfolding. Become a giver. Get into the giving consciousness. And as you do, you’ll discover a dimension of yourself in which you will say, “Wow, life has such exciting meaning.” And you will find also as Emerson says, “The affluence of heaven and earth will stream into you and through you.” And praise God for that. Amen.